This is the first page of quantitative aptitude problems. we will provide the most important competitive math question and easy solution using math tricks. Earlier, we have provided you chapter-wise concept and shortcut math formula. On that tutorials, we have taken some easy math problems to apply shortcuts formula. But now, we are going to apply shortcuts formula in exam level math problems. All the quantitative aptitude will from various chapters. If you need chapter wise math concept, shortcut formula and tricks then click below and read your desire chapter. Solution: Let's selling price is 100 units. And the cost price will be 80 unit as per the question. And gain =100-80=20. So, apply to the executing of the percentage of profit formula. Because we know gain and cost price. Math Problems 2:- A milkman bought 70 litres of milk for rupees 630 and added costless 5 litres of water. If he sells it 9 rupees per litres, then find his profit percentage. Solution:- We will use the above formula again. To use that formula, we have to find total profit he made. (70+5)*9 -630= 675-630 = 45 Rupees. 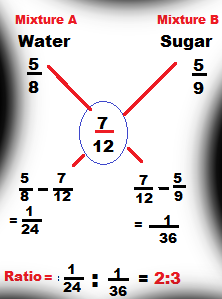 Problem 4: Water and sugar in two vessels A and B are in the ratio5:3 and 5:4 respectively. In what ratio, the liquids in both the vessels are mixed to obtain a new mixture in vessel C in the ratio 7:5? Solution: We can solve this problem using arithmetic operation. But the easiest method is the allegation. We use it for the quicker solution.